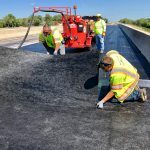 To address the pavement distresses caused by Upstate New York’s extreme changes in temperature, New York State Department of Transportation (NYSDOT) had been using a variety of hot and cold patches for repairs. 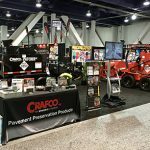 While this is common practice in many states, it is rapidly changing due to the introduction of patching material that is specifically formulated for wide ranging temperatures and climates. 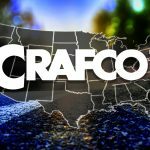 On February 12, 2014, NYSDOT used HP Concrete Cold Patch by Crafco for the first time. 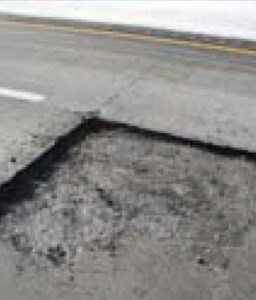 HP is a cold applied, single component patching material used for repairing potholes, spalls, cracks and other confined voids and distresses over 1-inch wide and greater than 1/2-inch deep, in Portland cement concrete pavement. It requires no mixing, heating, mechanical compaction or special installation equipment. To properly determine the product’s effectiveness, NYSDOT decided to use HP to repair distresses in a section of I-88 that runs through Richmondville, NY. The average daily traffic on this stretch of I-88 is 10,000 to 11,500 vehicles.